This Crazy BioShock Infinite Easter Egg Can't Be Real... Can It? It's got to be a coincidence. It simply can't be real… right? But… what if it is? That's more or less what I thought when I first saw this easter egg from the first BioShock, which seems to possibly, maybe, just maaaaaybe demonstrate a hilariously unlikely link between the 2007 game and its recently released sequel, BioShock Infinite. One of the coolest (or, for some people, most thuddingly unnecessary) parts of Infinite's mindfuck ending was the bit where all at once, Elizabeth transports herself and Booker to the first BioShock's underwater city of Rapture. As Elizabeth looks on, her massive mechanical guardian Songbird dies, crushed by the pressure at the bottom of the ocean. Listen at 0:14. Do you hear it? DO YOU?? Yes, it sounds like Songbird is dying in the background of this famous moment from the original game. You can hear the same sound in all of the videos, albeit sometimes more muted than others. Okay. So. This seems impossible. But... it's still fun to listen to it and come up with crazy theories. My theory? 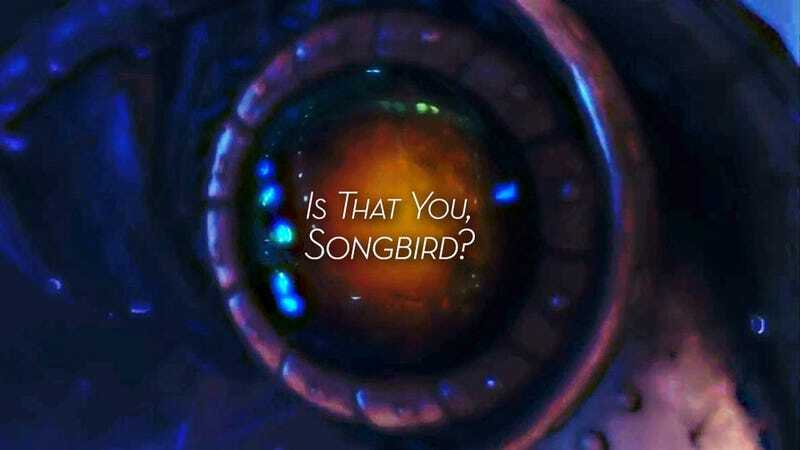 Some of the same people worked on the audio for both Infinite and BioShock, and it could well be that some sounds similar to the ones they used for Songbird turned up as ambient audio in BioShock. But plausible as it is, it's certainly not very much fun. What do you think? Coincidence? Clever easter egg? Or a sign that BioShock itself was created in an alternate universe where echoes of our own space and time still resonate?